The Samsung Galaxy Note 9 is a phone worth having because of its many features. One of the things that the phone aims at doing is making life easy and simple. This is best achieved by enabling gestures that can be used to open various things. You can use the fingerprint sensor gestures to open and close the notifications window among other activities. The gestures on this phone are not just limited to the fingerprint sensor. You can also use the heart rate sensor gestures to execute commands. Although this sensor is primarily meant to measure your heart rate in beats per minute, it can do much more when you know just the right gestures. You can even use it to take a selfie! We tell you how this is done plus a few more gestures and hope they do come in handy soon. A while back, all fingerprint sensors did is scan a finger placed on them and use the information to identify the phone owner. 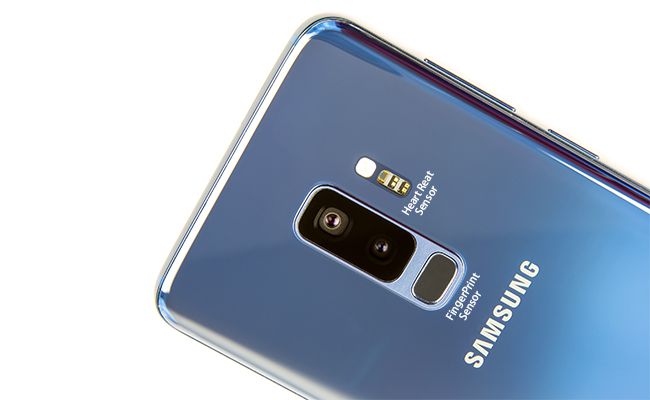 On the Galaxy Note 9, this sensor does much more than that including sensing swiping motions on it that mainly come in the form of gestures. How can you use this feature and what can it do? 1. Tap on the settings app to open it. 2. From the options, tap on “Advanced Features”. 3. You will see several options. 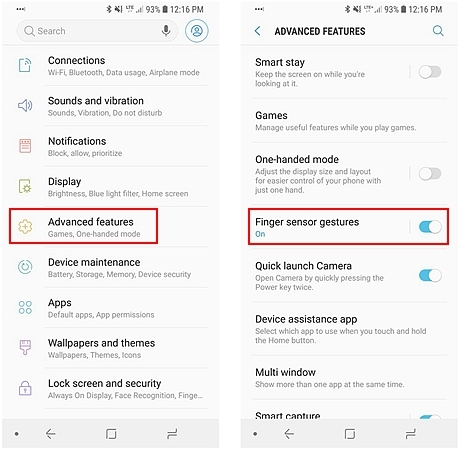 Tap on “Finger Sensor Gestures” option. 4. At the top of the screen, you will see a button. Toggle it so it turns on (becomes blue in color). Toggle the button next to the Samsung Pay option below the Finger Sensor Gestures option. Doing this will enable you to open Samsung pay using a gesture. With the fingerprint gestures enabled you can now use gesture to quickly perform actions on the phone. The first gesture is a downward swipe across the fingerprint sensor at the back of the phone. This opens up the notification window. While this is open, perform another downwards swipe and it will open up the Quick Settings panel. From there you can choose anything that you want to do fast. Another gesture is an upward swipe. When the quick settings panel and/or the notifications window are open, swipe upwards on the fingerprint sensor and they will be closed. 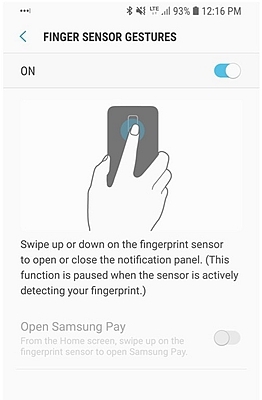 When you are in the Home screen, swipe your finger upwards across the fingerprint sensor and Samsung Pay will be opened. This is a mobile wallet application that allows users to easily make payments. The heart rate sensor is located at the back of your phone and is useful in measuring the number of beats your heart makes in a minute. This is achieved by using an optical light source that emits light that is shone through the skin. It then measures the amount of light reflected back every time there is a heartbeat and this is translated into a number. To use the heart rate monitor to measure heart rate, all one has to do is place a finger on the sensor and press lightly. But there is much more to a heart rate sensor than you think. You can use it to do lots of things using gestures. 1. Open the camera application from the phone’s home screen. 2. At the left bottom of the screen, you will see the Settings button. Tap on it. 3. 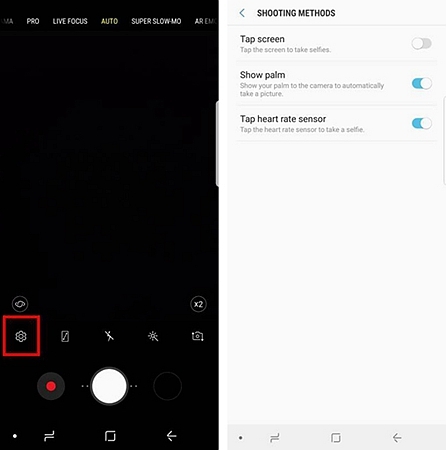 Tap on “Shooting Methods”. 4. Check that the Heart Rate Sensor is on (blue). If not, toggle it on. Now that it is set up you can use it to take a nice selfie. Open the camera and ensure selfie mode is on. Place a finger on the heart rate sensor, pose nicely and remove the finger from the sensor to capture the photo. With these gestures, you will find it is very easy to use the Galaxy Note 9 and do things first with just a swipe of the hand at the back. It is easy and convenient!